At Wolf Technical, a thorough and complete vehicle fire investigation shall be conducted each time. Wolf Technical not only contains personnel with a CVFI with knowledge of vehicles, but other personnel are present on staff with a complete understanding of vehicle systems and their mechanics. Vehicle fires present a unique challenge each and every time. Proper assessment of the origin and cause of a vehicle fire requires an understanding and knowledge of the investigation from witness statements to the maintenance records to an evaluation of the fire behavior and patterns found on the vehicle. Wolf Technical provides experts with the background and knowledge to properly conduct a thorough and complete vehicle fire investigation. 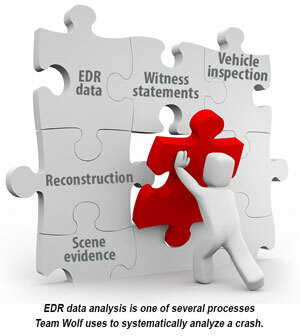 Vehicle Event Data Recorders contain a wealth of data a qualified accident reconstructionist can use to support their crash event analysis.